It requires some amount of courage, determination and a touch of madness to throw away what most would consider a normal life. Merwyn Coutinho felt there was certainly more to living in this world than the humdrum routine of existence with a corporate job, house, car and other requirements that determine the good life. He gave up the reality of the dream that most Indians chase after to bring light to the remotest corners of India, becoming what he calls a ‘dedicated traveller’. It began with vacations that increased in length as time went on. ‘Every time I stepped out, I wanted to stay there. I did not want to come back. So I went back to work and I said let me save some more money so next time I can take a longer vacation,’ says Merwyn. He consolidated his days of leave to be able to be away for longer periods of time. It was on one of these trips that Merwyn set off travelling to the north east region of India. 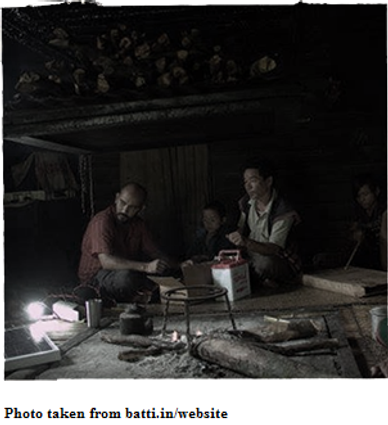 The spark for the Batti Project was not lit until Merwyn came to a place called Vijaynagar in Arunachal Pradesh. This area is close to the border of Myanmar and it took six days on foot to reach the place. While exploring, Merwyn and his friend encountered tribal people who had come to purchase their ration of salt and rice. They were highly intrigued by these people and their situation, which seemed unusual and exciting to experience firsthand. The tribal culture of North East India has existed for eons without the privileges that most of us have access to. After befriending the people there, they were invited by the tribes to come back the next year for Christmas as it was to be a significant affair with numerous other tribes coming together in celebration. They asked Merwyn and his companion to bring them gifts when they came back. Pondering over what would be the most effective gift to present them, Merwyn recalled how the tribal people, bereft of electricity grids or anything of the sort, would struggle with their chores as the sun went down. They would resort to clumsily using torches to work or huddling around a fire when the night came. The ideal gift in the light of this knowledge was to supply the village with light bulbs, and so a particular light bulb was selected that ran on solar energy. They went back with about two hundred bulbs and found that people were willing to pay for the bulbs, such was the urgency of their need. As they were leaving, the word got around and people from other villages began to approach them to provide them a source of light. This clamouring for light gave rise to the question of why these people need light when they had survived for centuries without it. Certainly, their need was not the same way we would need it, but there was a basic requirement which would make life much easier. This is where the Batti Project took root. Light was more essential to these tribes than education or anything else: they have they own way of thinking and doing things in place. They also have an in depth understanding of their environment. In another place, Merwyn and his friend found a man who had tried to bring light to his village by building a dam and a canal to generate electricity, but the venture had been stalled for his lack of knowledge. All he wanted was two hundred bulbs to light up his village. With Merwyn’s corporate background, he knew he could make use of CSR (Corporate Social Responsibility) funds and he used social media to reach out to people asking for help. Almost immediately he had responses from about eight to nine people. Back then it cost about 5000 rupees to light up a house, which would include three LED bulbs, a battery, a solar panel and wires. After they had finished working on lighting up that particular village, the question of the other villages arose, in addition to maintaining a balance as to how many villages they would include. Merwyn and his team finally decided to cover the entire area, starting with the remotest village. It was a source of wonderment to the tribal people. The old folks, especially an elderly lady, did not have a clue about how they were to work the electrical switches, since they had never seen the like before. ‘We had to hold her hand and tell her what a switch does. This was very shocking for me because we have light everywhere,’ says Merwyn. We take light for granted. Someone who has never seen a switch in their life will naturally be afraid to turn it on in case they spoil it. This behaviour of reluctance to embrace light was more evident with the old people. The younger people wanted the light fittings. When they visited the area a year later, the old woman who had refused to put the switch on was now not willing to switch it off. She said she had lived all her life in darkness at night and now she did not want the light to go away. Her grandsons would have to wait for her to fall asleep before they could turn it off. One of the village men, who had acted as a go between to bring light to the village, was looked upon with awe and respect by the rest of the people. As of now, 250 homes have obtained lighting and 5000 more are still on the list. Only LED bulbs are used in this project. While sustainable energy (solar, wind and thermal) is used to bring light to these homes, money is required to purchase other equipment and it is not feasible to ask people for money all the time. In order to raise money for the Batti Project, E-waste is being collected in Bangalore and Delhi and this waste is recycled to receive money. The Batti Project, which is administered by Further and Beyond, an organisation started by Merwyn and a friend of his from Bangalore, is further helped through fund raising. They are constantly looking for means to raise funds. One of their fund raising programmes includes a cycle ride challenge in Arunachal Pradesh. Participation requires raising funds for a particular number of houses. They are making a film on the impact of light in the urban and rural context. 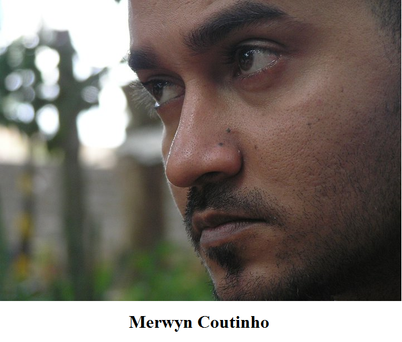 Merwyn has taken up various odd jobs to sustain himself in the course of the Batti Project. He relies greatly on the generosity and understanding of people to keep the project going and bring light to the remaining 5000 homes on his list. ‘I’m not saying I will be able to complete 5000 houses but if people are with us then it will happen,’ says Merwyn.